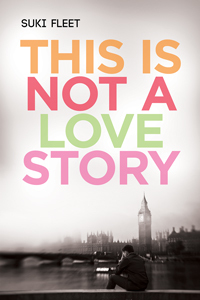 Guest Review: This Is Not A Love Story by Suki Fleet | Because two men are better than one! Today we have a guest review provided by Renae Kaye, author of Loving Jay and the soon to be released, The Blinding Light. Well, Suki Fleet certainly knows how to tear someone’s heart out. This Is Not A Love Story is certainly not a love story – it is a story of survival, with the two main characters so in love with each other, that they will fight with all they have to stay together. Two boys (I’d like to call them men, but they are not really), homeless and hopeless on the streets where being alone means you don’t survive long. The author has certainly explored the range of emotions a young boy feels when his survival depends on what happens to him hour to hour, and we, the reader, are along for the painful ride. Told from Romeo’s (Remee) POV, the author is unapologetically honest about what goes on when you live on the street – prostitution, drug use, violence, police, hunger, it all. The story is dark and gut-wrenching, nothing hidden or glossed over. In fact, when I had to leave these two boys on the cold street at about 55% last night so that I could get to sleep, I was heartbroken. I didn’t want to leave them out there in the cold. We follow Remee’s story and his struggle to stay alive, as well as stay with Julian. Julian, the older of the two, takes the bigger burden of them trying to find their way and make it through the night, selling himself and struggling with the pain afterwards. We meet a range of characters on the street too – those who are barely surviving, those who are about to succumb to its dank depths, and those who seem to enjoy the violence. Romeo and Julian find kindness along the way, but not enough to crawl out from where they are. This is a story I enjoyed reading. I’m not saying I laughed or even smiled, but I couldn’t put the book down. I was taken on a rollercoaster of despair that was so vivid, I couldn’t find my way out. But it is a story I recommend to you. I give this author 5 stars and applaud her for writing this novel. It is not a usual romance, and that is a good thing. To find out more about Renae Kaye and her books, visit her website. Renae’s latest book, The Blinding Light is available from Dreamspinner Press and will be released on 14th July. To find out more about Suki Fleet and her books, visit her website.